FOR DECADES, everyone from citizens to city leaders to developers has cursed Interstate 95 for cutting the city off from its waterfront. But with weedy, trash-strewn lots, crumbling piers and industrial sites hogging up acre after acre, the waterfront sometimes seemed a place unworthy of visiting anyhow. But the Delaware River Waterfront Corp. has a plan to remedy both problems. And it swears it'll work this time, because - unlike past unrealized plans - it's changing strategies. It's doing things piecemeal. First up was the Race Street Pier, the $6.5 million redevelopment of an eyesore into a recreational draw with eye-popping appeal. That opened in May 2011. Now: Penn's Landing Park. The corporation is hunting engineers and designers to plot the particulars of an 8-acre park it envisions will cover I-95 and Columbus Boulevard between Walnut and Chestnut streets. The new park, which will slope to the water, will reconnect Old City with the waterfront. A $400,000 grant from the William Penn Foundation will pay for the engineering and design phase; the corporation has no price tag yet - nor funding commitments - for the park's creation. Eventually, the corporation hopes to create parks every half-mile along the river, with a public trail connecting them, to increase public access. Staffers are working with private landowners to create easements, corporation spokesman Jodie Milkman said. But for now, the Penn's Landing Park is the priority. "With past efforts to develop Penn's Landing, everybody tried to hit a home run and get everything done at once. The plan would collapse under its own weight," said Tom Corcoran, the corporation's president. "This is not how that will happen. We'll do things in phases. We just took one block rather than try to overreach, and we think it will be attainable." Corcoran expects the design-and-engineering study to take six to eight months to complete. 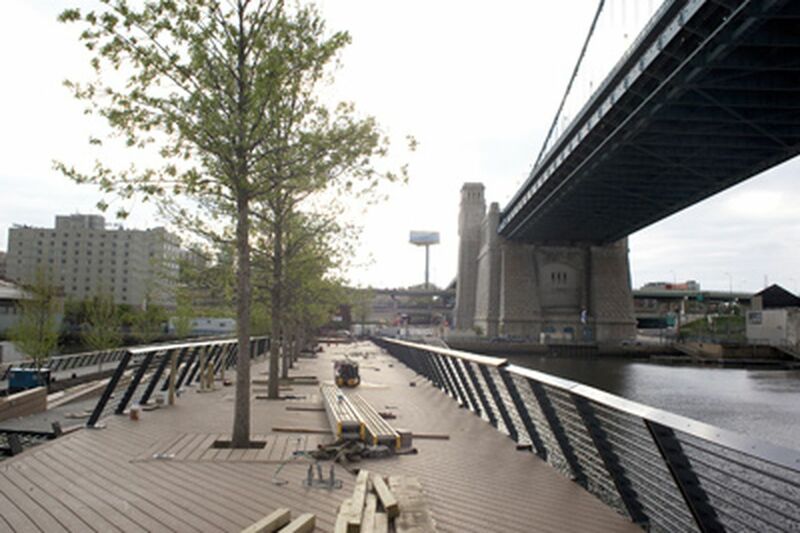 Planners also will be asked to extend the South Street pedestrian bridge and plot mixed-use developments on an existing Market Street parking lot and around the new Penn's Landing Park. Supporters hope the plan will catalyze development around it - the same way the Race Street Pier has. The Live Arts Festival and Philly Fringe will break ground next week at a former fire-hydrant pumping station at Race Street and Columbus Boulevard, which the artists' group bought to build a new headquarters, theater, studio, plaza and restaurant. "The Race Street Pier, for us, was both a demonstration of high-quality design on the waterfront and also this idea that, if we focus on building public infrastructure like the park, that would then spur private development around it," said Karen Thompson, the corporation's project manager.